Of the few dozen names encountered through November 1947 who cast their fate with rock ‘n’ roll just as it was getting started none was a more unlikely figure on the scene than Todd Rhodes, at least on paper. Already in his late forties with a successful career (from the 1920’s!) well in his rearview mirror the shift into rock ‘n’ roll at this stage of the game could either be seen as a desperate attempt to make good on his first recording opportunities in many a moon after a long stint as strictly a club attraction around Detroit, or a sign that senility was creeping in a few years early. But Rhodes struck gold with Blues For The Red Boy, a moody atmospheric instrumental gem that would make the charts when picked up for re-issue by King Records the following year and with that his course was thereby set. Yet what’s interesting to note is that unlike a lot of artists who were venturing into rock from another field and hedged their bets by pairing a more traditional pop or jazz tune with their rock experiments, thereby giving themselves a back door to slip out in case the rock audience rejects them outright, Rhodes did no such thing. In fact he doubled down on the new style and the song that became the hit was actually the intended B-side, which if anything shows – if one thinks of the term “rock” as a verb as opposed to a descriptive noun – that Rhodes transformation to a rocker wasn’t the result of circumstance at all when “Red Boy” vaulted him into the charts but rather it was his intended destination all along because Sportree’s Jump is even more traditionally aligned with the dominant rock style to follow. 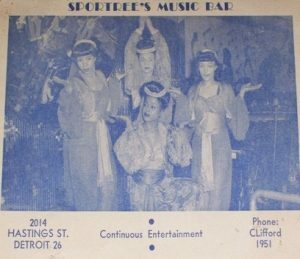 Nightclubs like Sportree’s Music Room were the heartbeat of the black community in big cities, in this case Detroit where Hastings Street (as we’ve seen) was the center of it all in the Nineteen-Thirties and Forties. The action there was non-stop and the smell of food permeated the streets which housed everything from bars and barber shops to the famed New Bethel Baptist Church, where Aretha Franklin’s father, the Reverend C.L. Franklin, became one of the most renown preachers in America. But the nightlife centered around the clubs. Jazz had their hot spots there, such as the Forest Club, which used its roller rink for the bigger shows (it also had a bowling alley! ), but as time went on there was a growing market for styles that weren’t so classy too and the surrounding blocks were rife with places where musicians of all bents could ply their trade in front of boisterous crowds each and every night. Whoever thought club work was a dead-end never was in Detroit at this juncture and the proof is found with Rhodes assent into the big time. After he ceased working with the nationally successful McKinney’s Cotton Pickers in the mid 1930’s he was resigned to being a sidemen for other combos until 1943 when he was convinced by his wife to start his own group and for the next five years they methodically climbed their way up the Motor City’s club ladder. They began at The Triangle Bar, lasting seven months there as the featured attraction (FYI – usually good acts quickly went from playing only specified dates to becoming the established house band at a venue), then jumped to Broad’s Club Zombie where they spent the last six months of 1945. This led to a more prestigious gig at the extremely popular Club Three 666’s where Rhodes had held court for half of 1946 before moving to Lee’s Sensation Lounge for nine months which incidentally is where he started experimenting with the burgeoning sounds that rock ‘n’ roll grew out of and which resulted in the label of that name for which Rhodes was now recording. It was a lesson in perseverance as during this time they had no recording contract until the very end, no chance for tours or major gigs elsewhere, and few people outside of the city limits, or at least the state limits, were even aware of their work. Yet it was that Detroit club scene which had fueled his rise back to the precipice of stardom. Sportree’s Jump was named for Sportree’s Music Bar on the corner of Hastings and Adams streets. Opened in 1946 by Raymond “Sportree” Jackson his joint became the hottest spot in the city for visiting dignitaries of the black music scene, in one week alone hosting a succession of stars in Dinah Washington, The Ink Spots and Eddie “Cleanhead” Vinson that would make even the biggest hot spots in New York or Los Angeles green with envy. Despite his recent record deal it’s important to remember that Sensation Records was strictly a local label. Its distribution was limited to Michigan and northeast Ohio, thus the idea of getting any national exposure from his releases wasn’t even in any of their thinking. To Todd Rhodes the more realistic goal was parlaying a local noisemaker about the club into a prolonged gig there, rubbing shoulders with and working behind some of the national stars who came through, and in the process improving his own standing just a little more. None of that, mind you, was probably going to be enough to break him out and let him become a star in his own right, but he’d managed to make his living his entire adult life as a musician (save for a brief stint during World War Two when he went to work at a factory, not because he had to, but because he wanted to do his part for the war effort, and even there when his employers found out who he was he largely entertained the fellow workers playing music), so Rhodes always had an eye on what would allow him to strengthen his reputation and keep him from having to work in a factory in peacetime just to put bread on the table. Thus his livelihood was club work and the records were merely a way to promote himself as an attraction AT those clubs. Obviously we can’t go back there to check out Sportree’s Music Room and immerse ourselves in the environment to see what it’s like. Hell, they demolished the notorious Hastings Street in the late 1950’s to build a freeway in the name of urban renewal, so all we’re left with is the record itself to try and get some sense of what we might’ve heard had we been around then and wandered inside. What we find is pretty invigorating. Rhodes kicks things off with a slightly too light piano, much like on the other side, but then the horns come along and provide a surprisingly strong bottom that carries it along, not too deep in their tone but admirable in their repetitive riffing. The drums aren’t much help in that regard as they’re still reliant too much on cymbals and possibly not even aware a bass drum exists, but Todd starts to chip in by never relenting with his left hand. Now the horn section which was so solid on Blues For The Red Boy, albeit in a totally different approach, here are called upon to ramp things up and unfortunately the trumpet takes that as a cue to step out front, always a drawback of early rock music. But the other horns are by no means passively watching from the sidelines as they too climb into the ring and work up a sweat by churning along at a steady clip. The first solo comes from the tenor sax and while not raunchy or seductive it’s nevertheless effective in keeping the pulse of the music throbbing. When he’s joined by the others, rather than be let down by the trumpet’s re-appearance the instruments seem to come to an understanding as to how to be best utilize their strengths while sidestepping their weaknesses. In fact of all the horn charts to date in rock this one might be the most forward looking among them. Even the tenor’s second standalone moment ramps up the grittiness to an appropriate level. If this was the sound you heard emanating out of the club late one Friday night as you sauntered along, there’s no doubt you’d be drawn to it enough to make your way inside and dig on what was going down. By the midpoint it’s churning with two interlocking horn lines and you’re fully engrossed in its vibe. When Rhodes takes the next solo, his nimble right hand subtly backed by a different horn line in the distance, the energy lags a little from the hard charging riffs that preceded it, but it’s still more than holding your interest. This is Rhodes’ genius and something that’s evident not just on these two sides, but in most of his work throughout his career. He was a top notch arranger, able to allow each instrument a chance to shine without detracting from the others, all of them working in unison to deliver a cohesive musical statement, a rarity for rock at this time with this many pieces in what were often slapdash recording sessions with little time to work out parts. By contrast Rhodes came in to the studio with all of the parts meticulously worked out and honed to perfection each night at the clubs, discarding what failed to keep the crowds transfixed while emphasizing that which got the best response, thereby taking the guess work out of the performance and requiring the band merely hit their notes with the appropriate feeling to get the song across. I think that’s the most impressive aspect of Sportree’s Jump, as even in the sterile confines of a studio without the crowd to spur them on it’s still is played with a sense of genuine looseness, in spite of it being so well-structured, which never fails to keep you moving. Call it artificial spontineity if you wish but when the results are so authentic it’s hard to find nits to pick in their assiduous approach. The club scene that spawned Rhodes was rapidly changing however as he broke out of that circuit when this record (or rather the flip-side) became a national hit a year later when distributed by King. In 1948 Raymond Jackson was fined $150 for having “an indecent floor show” at Sportree’s following the announcement of a public crusade against immorality, which considering the times was almost certainly just a public dressing down of a popular black nightspot by the police for having the audacity of having a place where folks can enjoy themselves. While the place would gain a measure of lasting recognition thanks to author Elmore Leonard who used the name for a Detroit character in his book Swag, the club shut down in 1950 after five glorious years during which time everybody from Johnny Moore’s Three Blazers and T-Bone Walker to Big Joe Turner and Tiny Grimes played gigs there. But none had seen their career’s propelled upwards as much as local hero Todd Rhodes, who in the short time the club was in business coincided went from local act to improbable national star. Many more records followed – both his own and backing others – now eagerly anticipated by a national audience rather than just the denizens of a small but thriving populace of one city. As his fame grew ever wider national tours followed which paid far better than he’d ever gotten staying within the confines of the city. But Rhodes and his band still cherished their ability to return to Detroit and play extended gigs in same clubs where they’d first risen from the ashes. Here, unlike the big tour dates when they had to play their handful of big hits and nothing else, they could instead stretch out and do as they pleased and it’d be met enthusiastically by those who knew them when that was all they ever seemed likely to achieve. A club act to the end… and by no means is that an insult. Leave a reply on "Todd Rhodes: “Sportree’s Jump”"